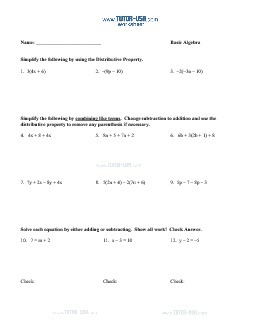 In this free algebra worksheet students must apply the distributive property and combining like terms to simplify expressions. Problems also include solving equations, inequalities, writing expressions, and completing word problems. Simplify the following by using the Distributive Property. Simplify the following by combining like terms. Change subtraction to addition and use the distributive property to remove any parenthesis if necessary. Solve each equation by either adding or subtracting. Show all work! Check Answer. Solve each equation by multiplying or dividing. Show work! Check answer. Write an equation and solve. Write an equation for the following situations. Then solve the equation. 23. The admission price to a football game increased by $8.00 to $45.00. Let p be the original purchase price. Fill in the blanks to write an equation to model the situation. Then solve the equation.